In this chapter I will show you how to set up the automated trading binary options on your IQ Option account. 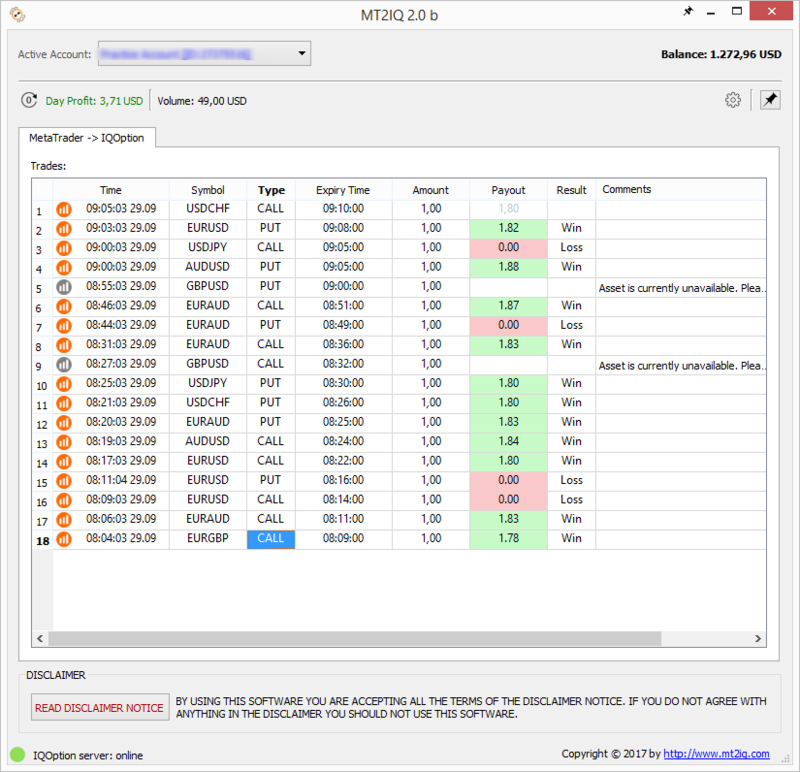 For this we need to install the bot (MT2IQ) that will be connected to MetaTrader through the special bot connector that operates like an indicator. The MT2IQ bot and the bot connector (mt2iq_connector.ex4/.ex5) are attached to this post (mt2iq_trial.zip), see below. Now, we will configure the bot and the connector for automated trading. a.) Extract the setup file from the archive (MT2IQ_trial.zip) and install it. b.) 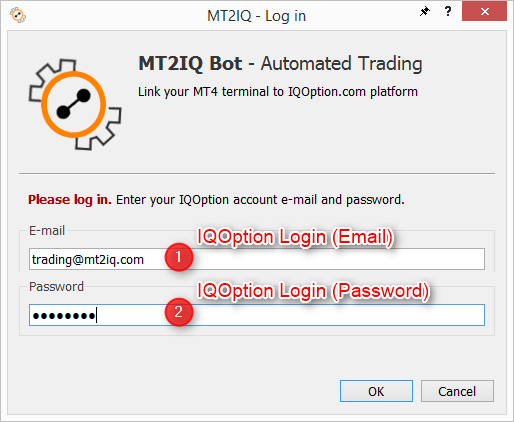 Run the installed MT2IQ bot and enter your IQOption account login and password. If the Login is correct, you should see your accounts listed in the dropbox list and the balance of the selected active account. The bot is now ready! 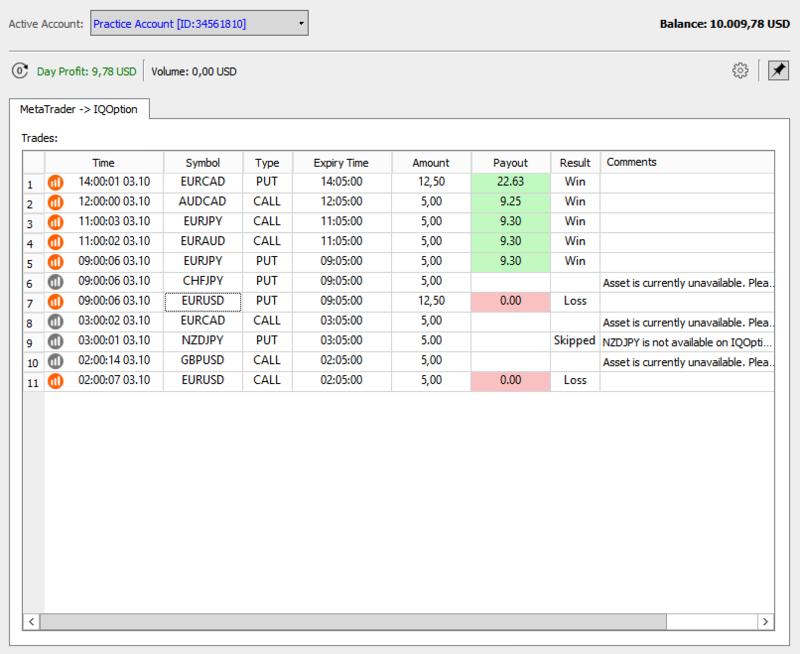 Select the account (Real, Practice or Tournement account) where the trades should to be placed. The configuration of the MT2IQ bot is done! In the next step we will configure the bot connector. 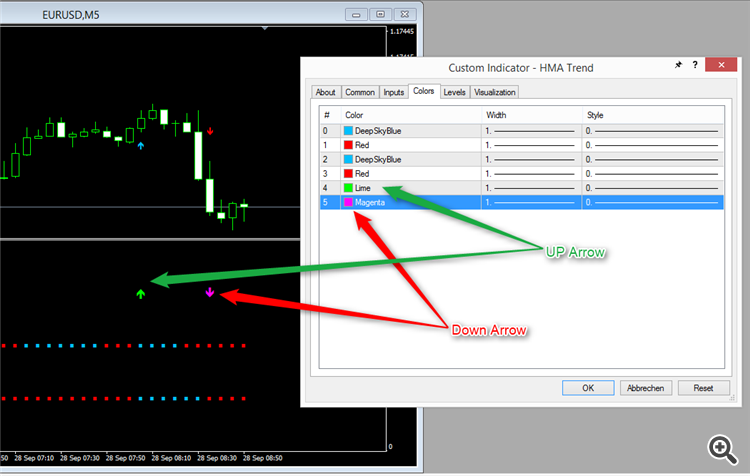 Copy the indicator (mt2iq_connector.ex4/.ex5 included in the zip-archive) to the indicators folder of your MT4/MT5 terminal. 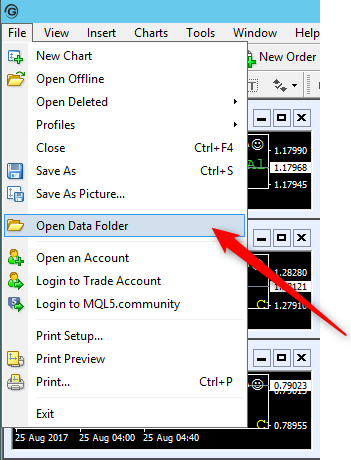 Click in the File menu on "Open Data Folder". 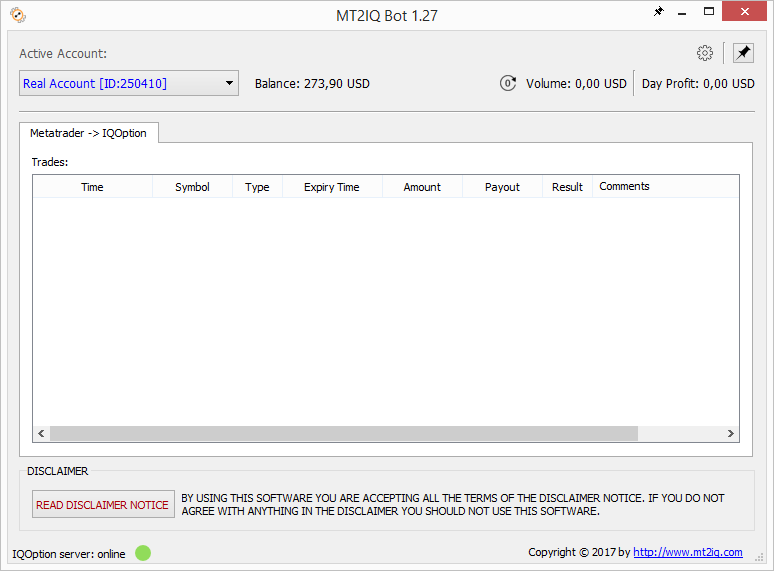 Navigate to the "MQL\Indicators" folder in your file explorer and copy the mt2iq_connector.ex4 to this folder. 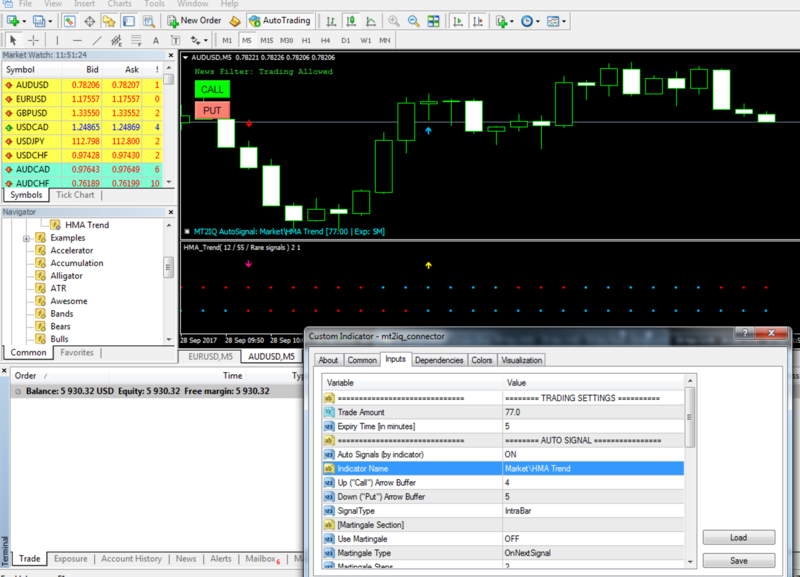 Then right-click on the indicators list in your MT4/MT5 terminal and click on Refresh, to refresh the list. Now you should see the mt2iq_connector in the indicators list. AutoSignals (by indicator) - ON/OFF: you can switch on/off the automatic signals forwarding to the bot from the indicator defined in the next parameter. 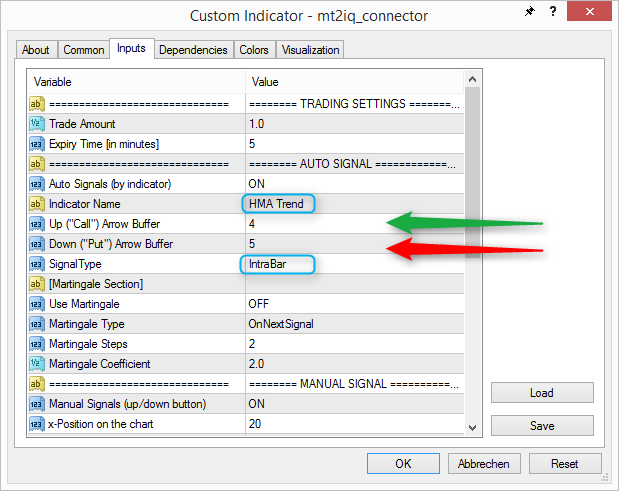 IndicatorName: enter the name of the indicator, whose signals you want to forward to the MT2IQ bot to trade on your IQOption account. 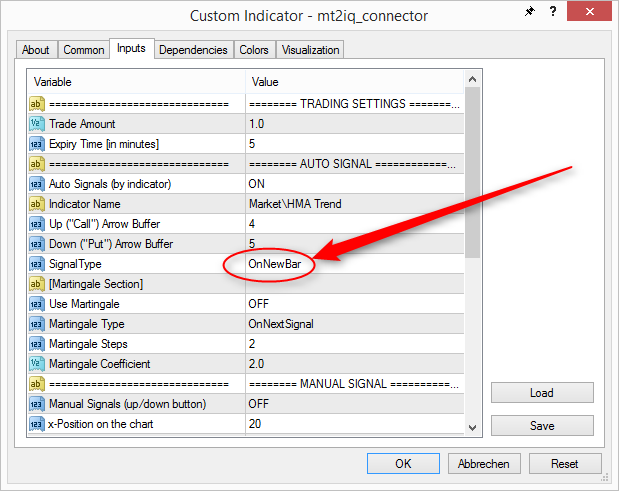 If you have purchased or rented the indicator from the MQL market, so the indicator is saved in the Market folder. In this case you should write "Market\" before the indicator name. In this example I use the indicator BinarySniper I have downloaded from the MQL market. Therefore I type Market\BinarySniper. If you use your own indicator, so you should simply type the indicator name. 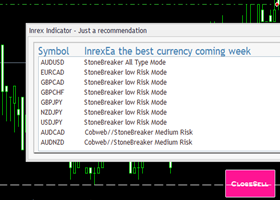 You can also move the indicator from the Market folder to the main indicators folder. Up ("Call") Buffer: here we need to specify the number of the Up-signal buffer. For the indicator BinarySniper the number for Up-signal buffer is 0 for a dot-signal and 2 for an arrow-signal. Down ("Put") Buffer: here we need to specify the number of the Down-signal buffer. For the indicator BinarySniper the number for Down-signal buffer is 1 for the dot-signal and 3 for the arrow. Signal-Type: "OnNewBar" means that the signal will be sent on the opening of the new bar. Since BinarySniper indicator (like many others) is signaling on the previous bar (dot). If the dot remains until the end of the bar then the arrow will appear on the new bar. So we can select this option and point the buffer to the previous bar (dot signal of BinarySniper) and not to the current bar (arrow signal of BinarySniper). (We also can select here "IntraBar" as a signal-type, but then we should point the Up ("Call") buffer to the buffer number 2 (Up-arrow signal) and the Down ("Put") buffer to the number 3 (Down-arrow signal) of BinarySniper. Be careful as each indicator has individual buffer numbers! In each case, you need to make sure which buffer is correct.). In the trading settings we should specify the trade amount and the expiration time. The trade amount is the size of each trade in the currency of your broker's account. The expiration time is the time in minutes. 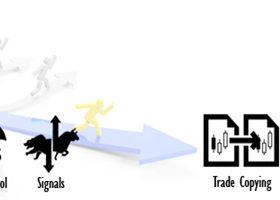 If you want to send signals also manually you can enable the manual trading. In this case set the parameter "Manual Signals = true". You will be able to send signal by pressing the buttons for Up and Down on your chart. Congratulations! You have configured the bot connector. 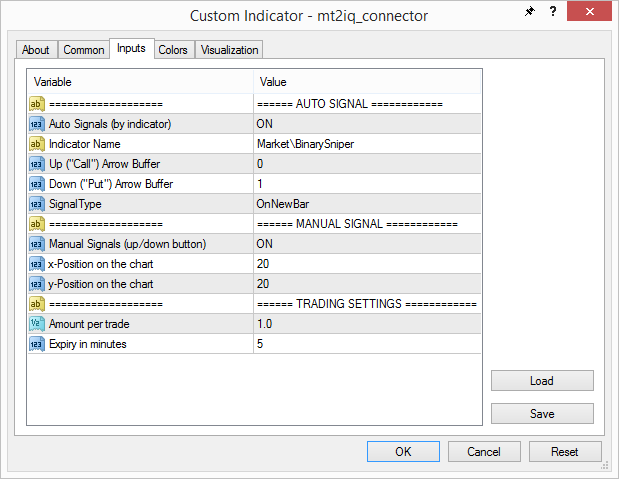 Now the indicators signals will be sent to the MT2IQ bot and the trades will be placed on your IQOption account. In the MT2IQ bot you will see all trades and the trading results. can you explain how I can use mq2iq with other indicators such as ADX or moving average? I did not understand what the number of the up-signal buffer is. Does this kind of AutoTrading violate IQ-Options terms and conditions? I mean they don't have easy way like binary.com or StockPair API for autoTrading. 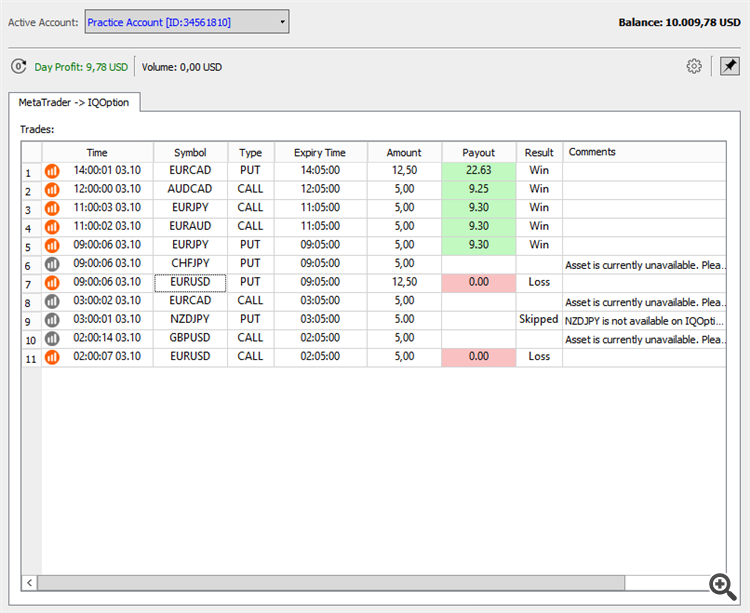 In the terms and conditions of IQOption autotrading is not mentioned. The bot emulates the trading platform. So technically there is no difference placing trades with the bot or manually at their web platform. Hello! Can the EA with output signals are buffer number work with the bot Mt2iq? or It only accept indicator through mt2iq_connector ? Looks very useful and exactly what I need. I'm using trial and please guide how to define Call/Put Buffer. How can we know the buffer numbers? I tried set to 0-1 anf 2-3 but it trigger trade all the time when new candle is drawing. Please help then I will buy your tool. You see here all objects (signals) that the indicator draws on the chart and their colors! Now we need to identify which buffer number (# left column) belongs to which arrow (chart object). Therefore I just change colors and see on the chart which colors belong to which arrows. As shown on this screenshot I figured out that buffer 4 belongs to the UP Arrow and buffer 5 belongs to the Down arrow. You see the arrows in the lower sub-window chart. And it looks like that the indicator is signaling intrabar! That means we should place the trade on the current candle. 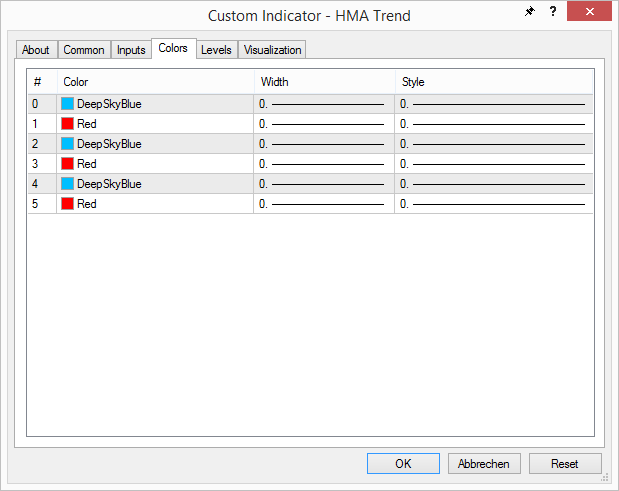 EDIT: for HMA Trend the SignalType should be OnNewBar!!! Since the arrow appears on the previous candle. Thanks for your prompt answer. I will have done settings then leave it running for few time then will get back to you. Nice answer ans support. LIKE! Additional, Can you update push notification for any trade of signals? that really useful while your AE running on a VPS! Have you tried that yet? I set it exactly like yours then no trigger when Arrow Up/Down pop up on the charts! No, I have not tested it. Have you set the signal type to Intrabar? When the arrow is appearing? On the current candle or on the last candle??? Please have a look on the screenshot above then test it for few minutes. When the signal show up it show on Alert and also send push to my Phone but mt2iq does not trigger anything! I will check it today in the evening and write my feedback here. Have you figured this out? What is the solution? I tried with this as well but it did not trigger anything when Arrows come up. I know how to use it now and work as expected. The News Filer is use Broker Time or local VPR time? Wait for few days late after testing with some signals then I will buy it. Do you have any recommended signal for IQoption? I recommend BinarySniper with martingale "on next signal". MartingaleStep = 3. News Filter uses terminal time. Therefore you need to enter the GMT offset of this time in the parameter of the News Filter to work it correctly. It is so far so good. One more thing it should be updated it steps in martingale. It look like, if the previous bid return 'nothing' mean LOST. Have a look at my testing here. 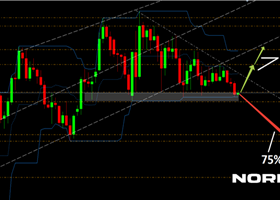 The EURCAD was not available at the previous bid then it was double as lost in the next one. We all know that martingale is dangerous so this must to be really careful calculated. And YES, this is BinarySniper. I rent it as you commended. Please double check the EA. It is not able to send any trade to IQoption within today. While IQ is open and live. I tried to restart it few time but now luck!